I start to believe that Wooliment knows how to take advantage (in a good way) the big group of their company : Infinite. When you have two both talented and good-looking boys in it, well it's a must-do to create a unit for just the two of them. Wooliment did it and their name is Infinite - H! Infinte - H(stands for hip-hop), consists of Hoya and Dongwoo, the two great Infinite's rappers and as you probably have realized by now their main elements are hip-hop and rap. Their debut album 'Fly High' consists of five songs with 'Special Girl' being the title track. The album itself it's a masterpiece and it won't let you down since many famous artists and producers have paricipate in the making such as Primary, Dynamic Duo, Beenzino, Bumkey and Zion T. Talk about quality! 'Special Girl' is incredible! Awesome rhythm, beat and melody! Love it from the first seconds! 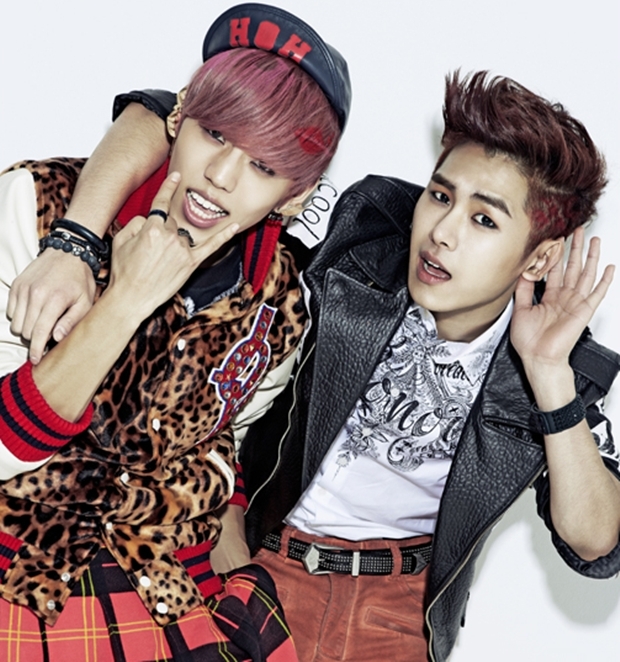 Hoya and Dongwoo bring their own style to the song and the result is no other than listening to it the whole time. The chorus is perhaps the most addictive part of the song, especially the woo hoo special woo hoo special ~~! The feet movement they do at this part is cool and catchy! As for the mv it has an interesting and funny plot. Hoya and Dongwoo are in love with a famous actress and they try to be close to her, each with a plan. Hoya paricipates in her movie but he kinda gets awkward when he has to hug her. I find it the most hilarious part of the mv. The director is giving him advices on how he should hug her..kekeke..and when he kicks the cleaner! Dongwoo on the other hand goes to her house to give her some flowers only to find out that there are also other guys doing the same thing. Although he pushed them away and reached her front door, he felt shy when the only thing he could give her were the flowers. So they left with one choice. They both dream how it would be if they were with her. I really like the quick four seasons change near the end of the video...now that's clever! Also the clothes were so good and match their style. Hoya in a suit and Dongwoo showing playfully his tongue were the highlights of the mv! Infinite - H made their debut and show them how special they are to you by watching their mv!